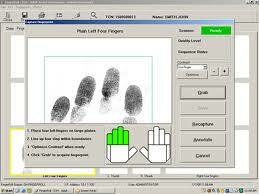 The Calvert County Sheriff’s Office offers both electronic and ink-rolled fingerprinting services. These services are provided at the Sheriff's Office, located at 30 Church Street, Prince Frederick, Maryland. The charge for electronic fingerprinting is based on the type of service being requested. Fees for these services are set by the Maryland Department of Public Safety and Correctional Services. Please refer to the schedule of fees for specific costs. Payment for electronic fingerprinting will only be accepted in the form of check or money order, made payable to the Calvert County Treasurer’s Office. Ink-rolled fingerprinting services are available on a walk-in basis on Mondays from 9 a.m. - 11 a.m. only, with the exception of government holidays. The charge for ink-rolled fingerprinting is $10 for Calvert County Residents. The cost for non-Calvert County residents is $20. Payment for ink-rolled fingerprinting will only be accepted in the form of check or money order, made payable to the Calvert County Alliance Against Substance Abuse (CAASA). Completed Livescan Pre-registration Application. Please print and bring the completed form with you. Payment in the form of check or money order, made payable to the Calvert County Treasurer's Office. For more information on fingerprinting services provided by the Calvert County Sheriff's Office, call 410-535-2800 ext. 2587, or contact us by email. call 410-535-2800 ext. 2587, or contact us by email.